Stroll across Tiananmen Square and into the Forbidden City. Take a walk on China’s most iconic sight - the Great Wall. View the Terracotta Warriors, one of the most significant archeological discoveries of the 20th century. Visit Zhujiajiao Watertown. Cruise to some of Australia’s and Asia’s most exciting and dynamic cities aboard luxurious Majestic Princess. One way flight to Beijing from your capital city. 3 night stay in Beijing, China at the Novotel Beijing Peace Hotel. Guided touring including Tiananmen Square, the Forbidden City and the Great Wall. Travel by Bullet Train from Beijing to Xian. 2 night stay in Xian, China at the Grand Dynasty Culture Hotel. Guided touring including the Terracotta Army, the Little Wild Goose Pagoda and the Xian Museum. Flight from Xian to Shanghai. 3 night stay in Shanghai, China at the Shanghai Central Hotel. Guided touring including Zhujiajiao Watertown, Yu Gardens and Huangpu River Cruise. 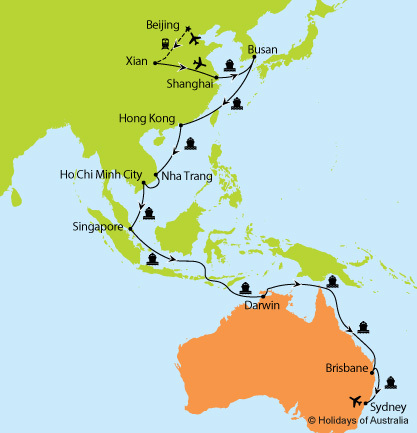 22 nights aboard Majestic Princess from Shanghai (China) to Sydney with port calls in Busan (South Korea), Hong Kong (China), Nha Trang (Vietnam), Ho Chi Minh City (Vietnam), Singapore Singapore, Darwin and Brisbane. Your cruise includes all on board meals and entertainment. Images courtesy of Princess Cruises, Denis Pan, Tourism & Events Queensland. †Return airport transfers included within a 50km radius of your closest international airport. *Departures from Sydney are subject to a saving of $250 per person. Departures from Perth are subject to a supplement of $150 per person. ^Save $500 per person offer is available on new bookings only and has been applied to the advertised price. Valid on bookings made & deposited by 18 April 2019.